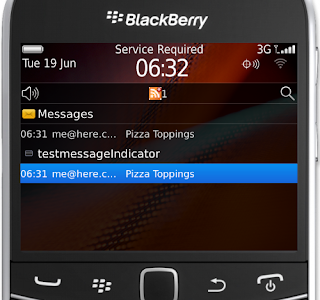 Today I want to share some interesting topic was display indicator icon and notification message on blackberry. That is use to display push notification, custom alert, reminder etc. I have user to notification and indicator icon on task management application. 1. Create Blackberry application new project ex: "testmessageIndicator". * formats for use with the message store. @source form MessageListDemo Demo example. This example you can also download from github. 3. Create new class " MyApp.java" and copy following code this is main class of application. * to use higher 16 bits. 4. Now create MyScreen.java and copy following code this is display screen and initialize icon and message indicator. 5. Set Indicator icon on /img folder please set name "Indicator.png" if image name different then please specify on code. //DemoMessage source is available in the messagelistdemo. * list of messages using a Vector. how to redirect to application on click of message & i dont want to put notifications in Inbox. please give any suggestions. just like social feed app. Thanks for provide the information. 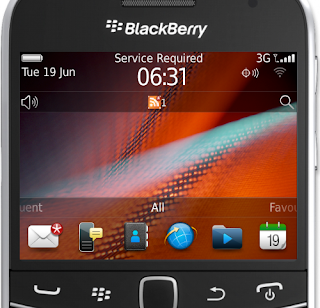 For more information please visit here blackberry push notifications.